Dr. Alex Vizcarra is proud to have over 25 years of experience in beautifying smiles, and creating and maintaining excellent dental health of thousands of people in the community. In 1988, he opened his first dental office in Garden Grove, Ca, where he stayed for about 5 years. He then set up a practice in 1990, in the City of La Mirada, where, for another 19 years, has developed an endearing relationship with the community before moving into a state-of-the-art facility at his current location in nearby La Habra in 2009. 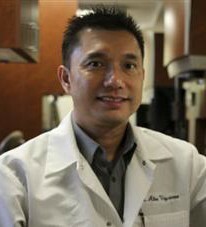 His highly meticulous nature, combined with his passion for dentistry, an eye for aesthetics, and an avid interest in technology ensures that his patients only receive the best dentistry has to offer, utilizing the latest and proven techniques, equipment and materials. He and his team members are committed to providing his patients with the best dental experience and comfort. To keep up with the ever changing, and improving world of dentistry, Dr. Vizcarra is also committed to continuing education, attending several dozens of hours of classes and seminars all over the country, in all disciplines of dentistry every year.